When I was a kid, I was prone to rifle through my dad’s extensive record collection. I think he was an early member of one of the record clubs because he had a pretty varied assortment of albums. In addition to most of The Beatles’ catalogue (which I now have), he had stuff from Earth, Wind & Fire to Neil Diamond and Barry Manilow (probably for my mother). But there was one album in his collection that my brother and I constantly put on — and, I must admit, it was not entirely for the music. 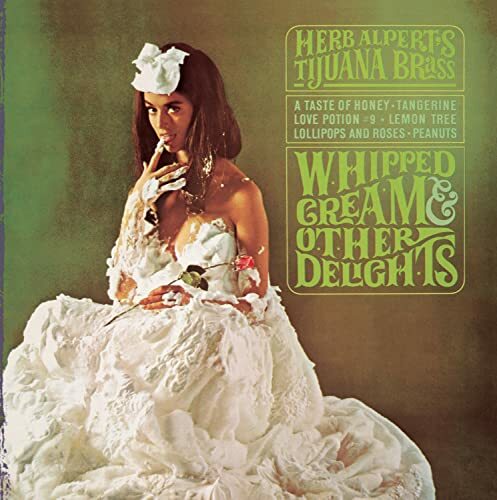 Anyone who has seen the cover for Herb Albert’s Tijuana Brass’ Whipped Cream & Other Delights knows exactly what I am referring to. For those that don’t, click here. I was recently talking with my brother and dad about the album, and I told them that a 40th anniversary edition was being released. Well, it’s out — and it comes with a poster! But enough about the artwork, let’s get to the music. Released in 1965, Whipped Cream & Other Delights made its mark across the musical landscape. Hipsters dug it as much as the squares, and even hippies respected the combo’s laid-back talent. As evidenced by the album’s title, the songs revolve around a food theme (song titles include the classic “A Taste of Honey,” “Peppers,” and “Lemon Tree.” The track I remember most fondly is “Love Potion #9” — my mother had the 45 single of the original song and it received countless spins in my childhood. This new 40th Anniversary edition of Whipped Cream & Other Delights includes two studio bonus tracks (“Rosemary” and “Blueberry Park,” and a full-color 20-page booklet and the poster. The album is remastered, has deluxe packaging and liner notes, and includes a cool introduction by Herb Alpert that contains personal recollections about the album’s recording sessions. If you’re a fan of jazz, big band, or just a curious music lover, I highly suggest checking out this album. Maybe one day your kid will discover this gem in your collection and fall in love with it like I did. And I know I’m not alone. You can get your copy of the album here.